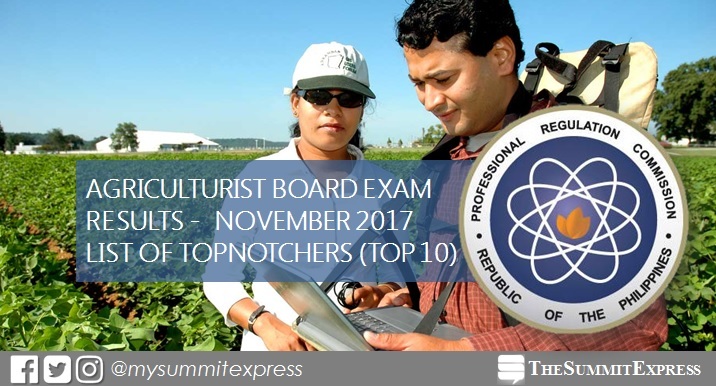 MANILA, Philippines - The full list of topnotchers or top 10 passers for November 2017 Agriculturist board exam is available on this page as officially released on Thursday, December 7, 2017 or in five (5) working days after the exam. University of Southern Mindanao - Kabacan graduate Neil Pep Dave Nellas Sumaya topped the board with 87.83%. It was followed by Gay Martinez Francia from Southern Luzon State University (SLSU) - Lucban with a rating of 87.17%. PRC conducted the licensure exam in the cities of Manila, All Regional Offices and Zamboanga on Tuesday to Thursday, November 28, 29 and 30, 2017. In the April 2017 Agriculturist board exam, Merie Joie Nable Magno from Central Luzon State University (CLSU) topped the board with 86.17%. It was followed by Richie Daliva Miguel of Mindanao State University (MSU) - Gen. Santos City and Kier Gumangan Santiago of CLSU, both having 86.00%. In the October 2016 exams, Arriz Lansangan Cabigting of Pampanga State Agricultural University and Roselle Estera Madayag from University of the Philippines (UP) - Los Baños aced the board with 85.83%. Monitor this page for the real-time updates on Agriculturist board exam results. Check out also the official website of PRC for more information.